From the sign-in table to the head table, Weddingstar has all the best wedding reception accessories you need to add a pop of charm and style to your wedding reception décor. 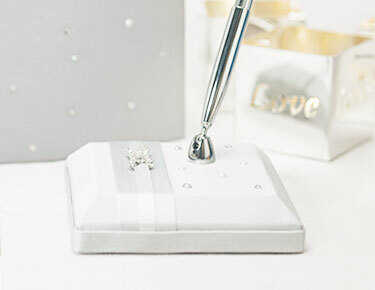 We have a large variety of classic and nontraditional guest books, wish boxes, pens, champagne flutes and other reception supplies that will help add a festive flair to your wedding day. We have wedding accessories for reception themes of all types — from super-rustic, down-to-earth and vintage to upscale, glamorous and speckled with rhinestones — to suit your unique wedding flavor. If you're in search of a great guest book alternative, you'll gush over our awesome personalized wedding guest books. 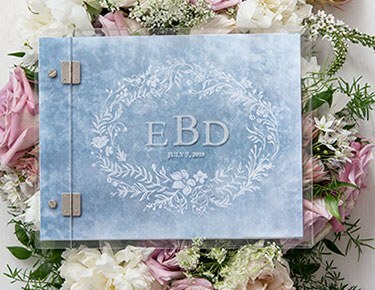 These semi-classic styles are sure to become a lasting keepsake long after you say "I do," with beautiful personalized acrylic covers that express your individual style. Each one is professionally customized with your name, wedding date, hashtag or special message. 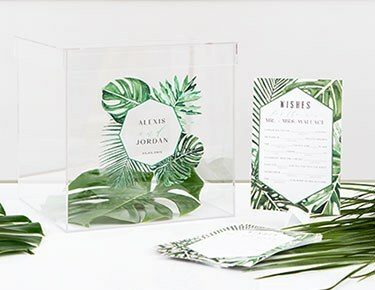 For something even more unique, consider choosing a clear wedding wishing well box that provides a modern twist on the classic wedding guest book. These displays allow guests to drop their thoughtful well wishes into a beautiful box that you'll want to keep forever. This variety also includes unique toasting champagne flutes that add a layer of decadence, charm and style to the head table. Complement your rose gold wedding party with lovely bubbly vessels teeming with rosé, or pick up a pair of sleek double-walled wedding champagne glasses to suit your modern or industrial sense of style. 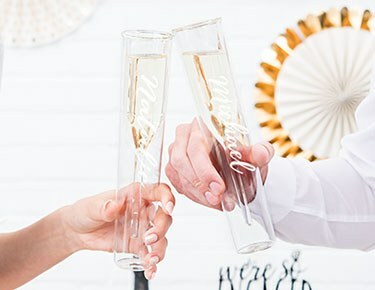 These toasting flutes also make amazing bridal shower and engagement party gifts, especially when paired with the couple's favorite bottle of bubbly! Choose champagne flutes and other table accessories that bring something extra-special to the head table and to your wedding style as a whole. At Weddingstar, we're all about helping our brides and grooms to be find wedding reception accessories that check all the boxes — budget, style, venue and more. Shop all of our wedding reception décor for all the essentials you need to throw a fabulous and memorable party! You can take advantage of great free shipping deals in North America at Weddingstar (Canada, the U.S. and Mexico qualify for free shipping on orders over $99) to help keep your wedding reception party décor under budget.